Throughout the months of January and February, New Century juniors prepped for the ACT test by reviewing with quizzes in Advisory. 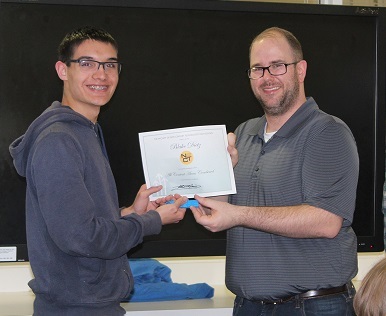 The results were collected for each content area (Math, Science, English, Reading) and students were rewarded with a celebration on Monday, February 11. Special thanks to the junior Advisory teachers (Mr. Archer, Mr. Baker, Sgt Jackson, Mr. Haynes, Mr. Mercieca, and Ms. Reed). Visit the Photo Gallery to see more pictures! Winners were rewarded a small gift and a certificiate. The overall highest scorer received a personalized 3D printed keychain!